Moreover the V- Lab sessions available at school premises used by teacher to impart knowledge is available to students any time any where using our online technology, adds more value to students and teachers to prepare oneself for the upcoming lab session as well for revision works by students, similar to hard copy record notes. The layout of V-Labs is uniform for all subjects and for all grades. Each session includes a Lab Layout, Demo and Do it yourself with audio visual animations using computer voices and images. 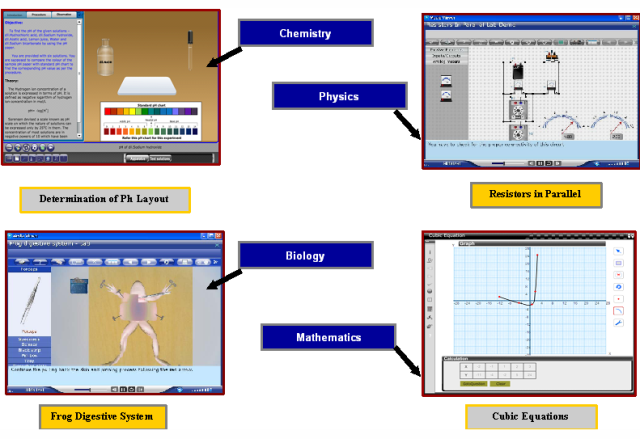 The Lab Layout and Demo are computer controlled automated video animations which familiarize a teaching staff and student with the lab environment concpetualized on to the animated lesson of converting a 3D on to a 2D object. Do it your self is demonstrated by the teaching staff or practiced by students. Here in the steps to be followed is very rigourously tested instantaneously. Error in steps to be followed or in reading observations will not permit to proceed to next step unless corrections are made to overcome the error encountered. This is achieved by always opening the demo session separately and identifying the error and remedy action to be followed. Subsequently the do it by yourself step could advance to next step. In a class of 30 to 40 students the teaching staff will not be able to repeat the experiment as many times as the strength of the student. Also if the student misses one critical step to be followed the whole experiment it will be difficult for the student to follow the steps when the student actually performs the actual lab session and there is no much time for going back and forth for corrections and proceeding. Here our unique technology comes in handy in equipping the students with prior knowledge of what all steps to be followed studiously in order to succeed in an actual demo session by practicing as many times as possible within the permitted time limits.